YORKVILLE, Ohio, Sept. 23, 2016 /Christian Newswire/ -- The Chrisagis Brothers are known worldwide for their anointed music ministry that changes lives for Jesus. This past year has been an unbelievable year for the Brothers, they have ministered throughout the United States with three bookings every week as they traveled to Florida, Texas, New York, South Carolina, North Carolina, Georgia, Tennessee, Missouri, etc. The Chrisagis Brothers just won Best Christian Duo Of The Year at the Extraordinary People Awards in Fort Lauderdale, Florida where 200 countries voted and were all represented at the Gala. This award is different then all others, the fans don't vote and neither do the performer's peers but countries vote and that in itself is powerful. 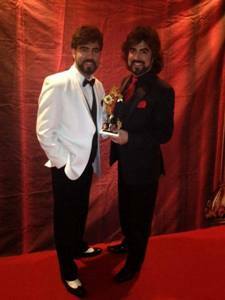 The Award proved that God has taken the Brothers world-wide with their Music Ministry. In Dec. the Brothers will be in concert with legendary Grammy Winner and Christian artist Russ Taff. Then in 2017 the Brothers will be on a huge tour with many of the pioneers in Christian music traveling from state to state called The Legends Tour, much like the Winter Jam Concert Tours. The Brothers are also busy with Prison Fellowship International. Prison Fellowship started with Chuck Colson, former aide to President Nixon. Colson gained notoriety when he was convicted for a Watergate-related offense and served seven months in prison. This is where Colson's life changed and he became a born again Christian. When Colson walked into freedom he had a new mission to give prisoners the chance to receive Jesus and turn their lives around through Christ. He founded Prison Fellowship in 1979 and for the past 38 years, they have proclaimed the Gospel to prisoners and their families world-wide. The Chrisagis Brothers have always had a heart for children. They had a children's TV series for 3 years and then travel through-out the U.S. with music, puppets and skits. They also did many TV variety shows and a plush toy line to help kids learn, read and grow in character. So when they got a chance to be spokespersons for the Child Sponsorship Program, they jumped at it right away. Millions of Children around the world have lost one or both parents to incarceration. Of these, nearly one million children of prisoners live in high-risk situations: poverty, isolation, abandonment. They become outcasts in their communities and are ten times more likely to get caught up in the criminal justice system. The mission that Prison Fellowship and the Chrisagis Brothers have is to rescue, restore, and rebuild the lives of these children world-wide. For more info on this check out the Chrisagis Brothers website at chrisagisbrothersministries.org or visit pfi.org.